A federal judge has thwarted Donald Trump’s efforts to end DACA, the Obama-era protections for undocumented immigrants who entered the country as minors, in part thanks to Trump’s own tweets. “We seem to be in the unusual position wherein the ultimate authority over the agency, the Chief Executive, publicly favors the very program the agency has ended. For the reasons DACA was instituted and for the reasons tweeted by President Trump, this order finds that the public interest will be served by DACA’s continuation,” he wrote. The Trump administration announced DACA’s phase-out in September. The program is set to end March 5, and about 690,000 undocumented immigrants once protected under DACA may face deportation. Between September and March, an estimated 122 people will lose their federal protection per day, according to the Center for American Progress. 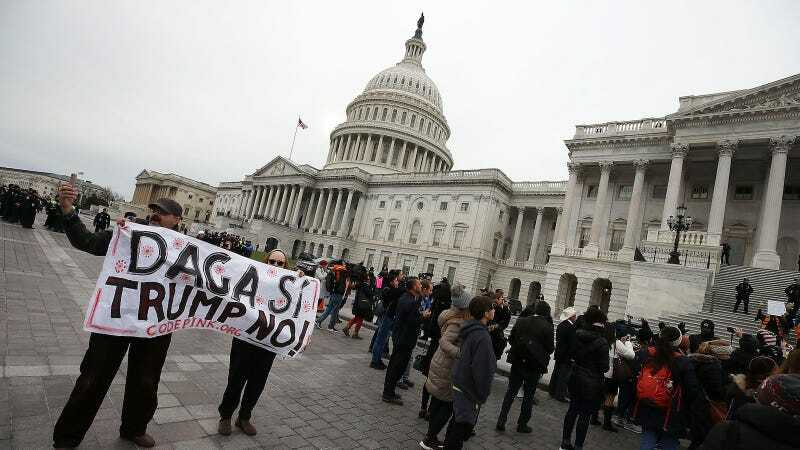 The order, which applies nationwide, allows DACA recipients to renew their status, but does not require the federal government to process new applications for the program. However, the Trump administration plans to appeal Alsup’s ruling, and advocates fear that the Department of Homeland Security may not cooperate.